It's estimated the long-distance electric buses can travel between 250 and 280 kilometers on a single charge. 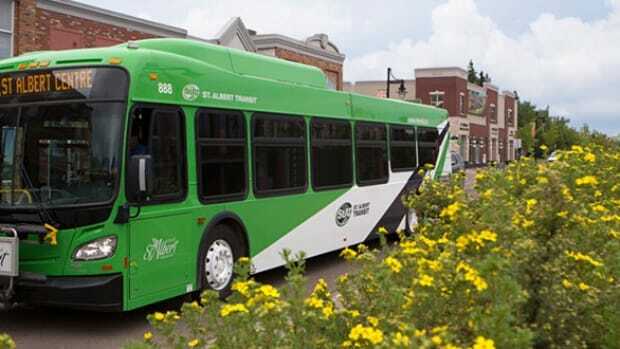 ST ALBERT - The city of St. Albert is going green — both literally and esthetically — with three electric buses on routes in and around the city this week. "They're virtually silent," Wes Brodhead, chair of the Capital Region Board transit committee and a St. Albert city councillor, said. "This, as opposed to the diesel buses and the roar that accompanies them as they drive down the street." You may not hear them coming but you'll definitely see them. The 35-foot electric buses are painted bright green to represent the city's goal of adopting sustainable transportation. "There's no noise pollution, there's no air pollution, and it just kind of fit with the whole theme of the city," said St. Albert Transit director Kevin Bamber. The buses cost about $970,000 each. Adding in the required infrastructure, including charging stations, the project cost a total of $3.1 million, with two-thirds of the funding coming from the provincial government's Green Transit Incentives Program. The electric buses are estimated to go between 250 and 280 kilometres on a single charge. "That would mean any of the routes that we currently have through St. Albert or into Edmonton, an electric bus could do the morning route, come back, park in the afternoon and go back out and do the afternoon route without a charge," Bamber said. Brodhead went to an international transit conference in Montreal, where he said manufacturers presented various electric bus designs. "The conversation around the conference was not if but when the industry will fully embrace electrification," Brodhead said. The vehicles were built in California by BYD Ltd., one of only two companies making the long-endurance electric buses. The city has ordered four more of the buses and hopes to be running all seven by the end of the year. Eventually, Brodhead envisions having a full fleet of 60 electric buses in St. Albert. Edmonton is expected to operate as many as 40 electric buses but city staff are still in the planning stages.